CP Opening for Daytime this Weekend! 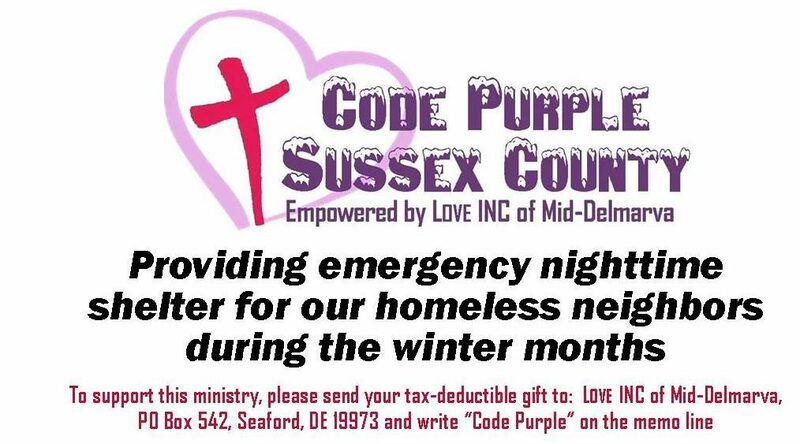 Due to the frigid daytime temperatures, Code Purple Sussex County will keep our doors open during the day this weekend! St. Luke’s will stay open for daytime hours on Saturday (1/6) and Sunday (1/7). The Parish Hall is located at 202 N. North Street, Seaford, DE 19973. Milford Avenue Methodist is open today (1/5) for daytime hours. They will also be open during the day on Saturday (1/6) and Sunday (1/7). They are located at 20 N. Church Street, Milford, DE 19963. Please email us at codepurplesussexcounty@gmail.com or call 302-519-0024 for more information.